At Gearbox's recent PAX East panel, they revealed a new playable class for Borderlands 2 called Mechromancer! See more details on the class below! The Mechromancer will be an all-new playable character that we plan to develop after work on Borderlands 2 is finished and the game is in certification. Currently, she exists as an idea and a couple of sketches, but we expect her to become a reality at some time after Borderlands 2 is completed. 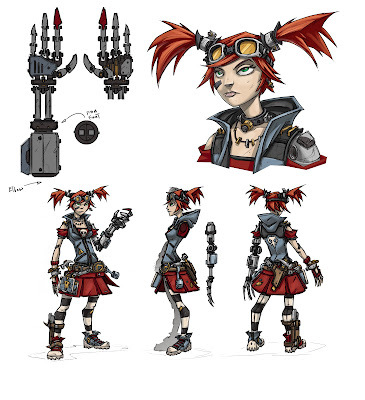 As with many new ideas, we don't yet know exactly how the Mechromancer will play or when she will be available, but our estimate is that she will be released within 60 to 90 days after the launch of Borderlands 2. At that time, we also expect to release a compatibility update so that people who have the Mechromancer can play with those who don't.